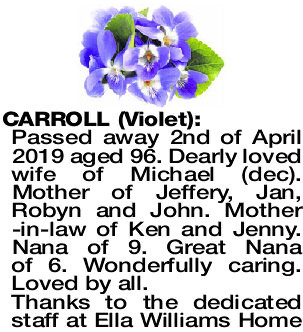 Passed away 2nd of April 2019 aged 96. Dearly loved wife of Michael (dec). Mother of Jeffery, Jan, Robyn and John. Mother -in-law of Ken and Jenny. Nana of 9. Great Nana of 6. Wonderfully caring. Loved by all. 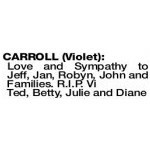 The Funeral Service for Mrs Violet Carroll of Noranda will be held in the Noranda Uniting Church, 79 Camboon Rd, Noranda on THURSDAY (11.4.2019) commencing at 10:00am.